When we want to have a morning meeting in Bandung, sometimes it is quite difficult to find one great place to go, especially if you are considering to have traditional foods in the center of Bandung. So, in this Sunday morning, we've decided to go and try some of the dishes at Saparua Sport Center. 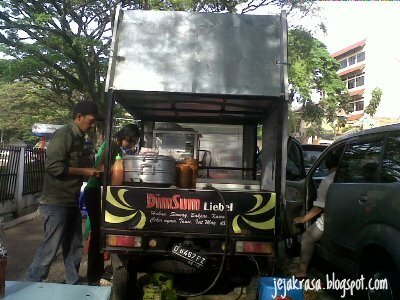 There are several great vendors opened here, including the Liebel Dimsum, and several Chicken Porridge and Nasi Kuning vendor. After a quick scan throughout the vendors, we've decided to visit Chicken Porridge and Nasi Kuning vendor, as this place was fully crowded. The Chicken Porridge was ok, but the Nasi Kuning tasted great. 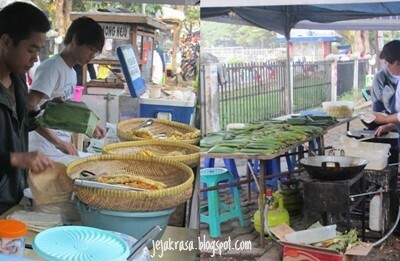 Nearby there is also a tahu pletok and tempe mendoan (soy-based fried snacks) vendor which is also crowded. The tahu pletok was great! Overall we spent around Rp 30.000 (US$ 3) for three people's breakfast. Not bad eh?